Croat T. K., Bernatowicz T. J., Jadhav M. (2014) Isotopic anomalies preserved within internal grains in high-density presolar graphites. Meteorit. Planet. Sci. 49, #5354. Jadhav M., Ernst Zinner, Sachiko Amari, Marco Pignatari, Falk Herwig, and Roberto Gallino (2014) Presolar graphite grains and their stellar origins. Nuclei in the Cosmos XIII, Debrecen, Hungary. Jadhav M., Pignatari M., Herwig M., Zinner E., Gallino R., and Huss G. R. (2013) Presolar graphite grains from post-AGB stars. Lunar Planetary Science Conf. XLIV, #1963. Jadhav M., Schmitz S., Croat T. K., Brenker F. E., Schmitt M., Vekemans B., Vincze L., Schoonjans T., Wellenreuther G., de Samber B., Falnekberg G., Burghammer M., and Huss G. R. (2013) Nano-synchrotron XRF and XRD: A powerful non-destructive technique for in-situ chemical and structural analyses of presolar grains. Lunar Planetary Science Conf. XLIV, #2928. Jadhav M., Savina M.R., Jokela S., Elam J., Huss G.R., and Zinner E. (2012) Zr and Ba isotopic compositions of high-density graphite grains from Orgueil. Meteorit. Planet. Sci. 47, #5183. Zinner E., Jadhav M., and Gallino R. (2012) On the stellar sources of high-density presolar graphite grains. Meteorit. Planet. Sci. 47, #5047. Schmitz S., Brenker F.E., Schmitt M., Vekemans B., Vincze L., Schoonjans T., Wellenreuther G., De Samber B., Falkenberg G., Burghammer M., and Jadhav M. (2012) High resolution synchrotron XRF and XRD analyses of presolar graphite spheres from the Orgueil meteorite. Meteorit. Planet. Sci. 47, #5215. Jadhav M., Pignatari M., Herwig F., Zinner E., Gallino R., and Huss G.R. (2012) Rare presolar graphite grains from evolved low- and intermediate-mass stars. XII International Symposium on Nuclei in the Cosmos. Abstract #179. Zinner E., Jadhav M., and Gallino R. (2012) On the origin of high-density presolar graphite grains. XII International Symposium on Nuclei in the Cosmos. Abstract #085. Jadhav M., Nagashima K., and Huss G.R. (2012) Nitrogen isotopic compositions of mainstream SiC grains from chondrites with a range of cosmic ray exposure ages. Lunar Planetary Science Conf. XLIII, #2826. Croat T.K., Berg T., Jadhav M., and Bernatowicz T.J. (2012) Presolar refractory metal nuggets. Lunar Planetary Science Conf. XLIII, #1503. Zinner E., and Jadhav M. (2012) Internal “isochrones” within presolar dust grains.Lunar Planetary Science Conf. XLIII, #1122. Jadhav M., Nagashima K., and Huss G.R. (2011) Carbon, nitrogen, and silicon isotopic compositions of presolar silicon carbide grains from the LL3.1 chondrite Bishunpur. Meteorit. Planet. Sci. 46, A112. Croat T. K., Jadhav M., Lebsack E., and Bernatowicz T. J. (2011) TiC and rutile within a supernova graphite. Meteorit. Planet. Sci. 46, A51. Jadhav M., Zinner E., Amari S., and Maruoka T. (2011) More Ca and Ti isotopic ratios in high-density, presolar graphite grains from Orgueil. Lunar Planetary Science Conf. XLII, #1599. Croat T. K., Jadhav M., Lebsack E., and Bernatowicz T. J. 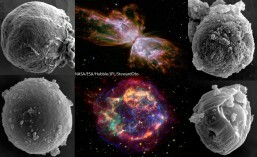 (2011) A unique supernova graphite: contemporaneous condensation of all things carbonaceous. Lunar Planetary Science Conf. XLII, #1533. Wopenka B., Jadhav M., and Zinner E. (2011) Raman analysis of high-density presolar graphite grains from the Orgueil carbonaceous chondrite. Lunar Planetary Science Conf. XLII, #1162. Zinner E., Jadhav M., Gyngard F., and Nittler L. R. (2011) Bonanza, a huge presolar SiC grain of type X. Lunar Planetary Science Conf., #1070. Jadhav M., Wopenka B., Amari S., Maruoka T., and Zinner E. (2010) High-density, carbon-13 enriched graphite grains from Orgueil. Meteorit. Planet. Sci. 45, A94. Heck P. R., Jadhav M., Meier M. M. M., Amari S., Zinner E., Baur H., and Wieler R. (2010) Radiogenic and nucleosynthetic neon-22 from individual presolar Orgueil graphites. Meteorit. Planet. Sci. 45, A79. Zinner E., Jadhav M., Gyngard F., and Nittler L. R. (2010) Bonanza: isotopic anatomy of a large presolar SiC grain of type X. Meteorit. Planet. Sci. 45, A225. Jadhav M., Amari S., Zinner E., and Maruoka T. (2010) Presolar graphite grains from Orgueil: Some unresolved issues. Lunar Planetary Science Conf., Abstract # 1035. Croat T. K., Jadhav M., Lebsack E., and Bernatowicz T. J. (2010) Microstructural differences among the isotopic groups of low-density Orgueil graphites. Lunar Planetary Science Conf. XLI, Abstract #1867. Croat T. K., Jadhav M., Lebsack E., and Bernatowicz T. J. (2009) Refractory metal nuggets within presolar graphite. Meteorit. Planet. Sci. 44, A55. Jadhav M., Amari S., Zinner E., and Maruoka T. (2009) Continued isotopic studies of low-density graphite grains from Orgueil. Lunar Planetary Science Conf. XL, Abstract # 2394. Croat T. K., Jadhav M., Lebsack E., and Bernatowicz T. J. (2009) Low-density presolar graphite spherules from the Orgueil meteorite. Lunar Planetary Science Conf. XL, Abstract #2175. Jadhav M., Amari S., Zinner E., and Maruoka T. (2008) Ti isotopic ratios in low-density graphite grains from Orgueil. Lunar Planetary Science Conf. XXXIX, Abstract #1047. Jadhav M., Savina M. R., Knight K. B., Levine J., Pellin M. J., Amari S., Marhas K. K., Zinner E., Maruoka T., and Gallino R. (2007) NanoSIMS and RIMS isotopic studies of high-density graphite grains from Orgueil. Meteorit. Planet. Sci. 42, Abstract #5310. Jadhav M., Amari S., Marhas K. K., Zinner E., Maruoka T., and Gallino R. (2007) Ca and Ti isotopic ratios in high-density graphite grains from Orgueil. Lunar Planetary Science Conf. XXXVIII, Abstract #2256. Jadhav M., Amari S., Maruoka T., and Zinner E. (2006) Supernova graphite grains from Orgueil. Meteorit. Planet. Sci. 41, Abstract #5323. Gyngard F., Amari S., Jadhav M., Marhas K., Zinner E., and Lewis R. S. (2006) Titanium isotopic ratios in KJG presolar SiC grains from Murchison. Meteorit. Planet. Sci. 41, Abstract #5334. Jadhav M., Maruoka T., Amari S., Marhas K. K., and Zinner E. (2006) Si and Mg-Al isotopic studies of presolar graphite from Orgueil. Lunar Planetary Science Conf. XXXVII, Abstract #2177. Gyngard F., Amari S., Jadhav M., Zinner E., and Lewis R. S. (2006) Carbon, nitrogen, and silicon isotopic ratios in KJG presolar SiC grains from Murchison. Lunar Planetary Science Conf. XXXVII, Abstract #2194. Jadhav M., Amari S., Zinner E., and Maruoka T. (2005) Continued isotopic studies of presolar graphite from Orgueil. Meteorit. Planet. Sci. 40, A75. Jadhav M., Maruoka T., Amari S., and Zinner E. (2005) Finally: Presolar graphite grains identified in Orgueil. Lunar Planetary Science Conf.XXXVI, Abstract #1976. Jadhav, M., and Green, D. (2002) Theoretical traveltime curves for Mars. Eos Trans. AGU, 83 (47), Fall Meet. Suppl., Abstract P62A-0371. Welch, S., Ayers, J., Combs, C., Davis, C., Jadhav, M., Laverty, B., Nasrallah, J., Stoertz, M., Green, J., and Kramer, J., (2002) Hydrogeology of a coal refuse pile, Jackson County, Ohio. Geological Society of America Abstracts with Programs of the Southeastern and North-Central Sections Annual Meeting, Geologic Society of America, Lexington, KY, April 3-5, 2002, vol. 34, no. 2.